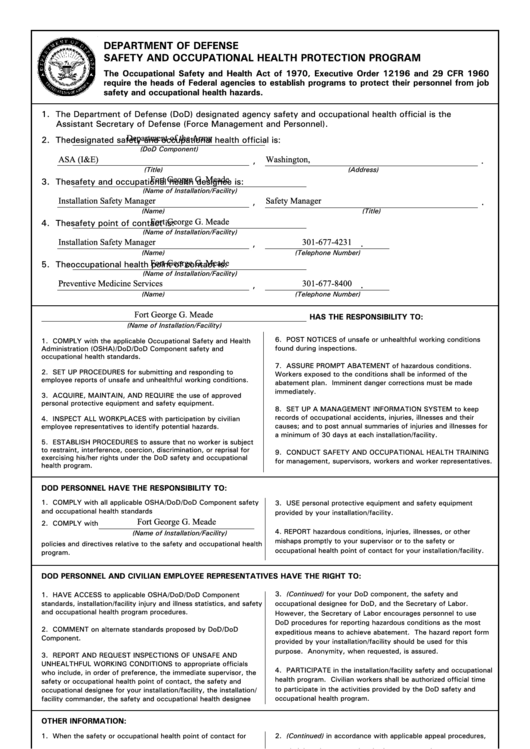 Download a blank fillable Dd Form 2272 - Department Of Defense Safety And Occupational Health Protection Program in PDF format just by clicking the "DOWNLOAD PDF" button. Complete Dd Form 2272 - Department Of Defense Safety And Occupational Health Protection Program with your personal data - all interactive fields are highlighted in places where you should type, access drop-down lists or select multiple-choice options. safety and occupational health hazards. Assistant Secretary of Defense (Force Management and Personnel). 7. ASSURE PROMPT ABATEMENT of hazardous conditions. employee reports of unsafe and unhealthful working conditions. personal protective equipment and safety equipment. employee representatives to identify potential hazards. a minimum of 30 days at each installation/facility. for management, supervisors, workers and worker representatives. occupational health point of contact for your installation/facility. occupational designee for DoD, and the Secretary of Labor. and occupational health program procedures. purpose. Anonymity, when requested, is assured. or administrative or negotiated grievance procedures.